Born into a wealthy, middle-class family with a Haitian mother and Belgian father, Gaetjens grew up in one of the more affluent parts of Haiti’s capital, Port-au-Prince. He joined his first club, Etoile Haïtienne, when he was 14 years old. A mere four years later, the prodigious teenage striker bagged two goals – including a last-gasp winner – in Etoile’s historic 4-3 win over Racing Club Haïtien, helping the club lift their first ever league title in 1942. They lifted the trophy again two years down the line, once more Gaetjens playing a key role. After that Etoile had to wait another 17 years before they were crowned champions. Despite the success he enjoyed domestically, Gaetjens realised that there was no proper money to be made playing football in Haiti. 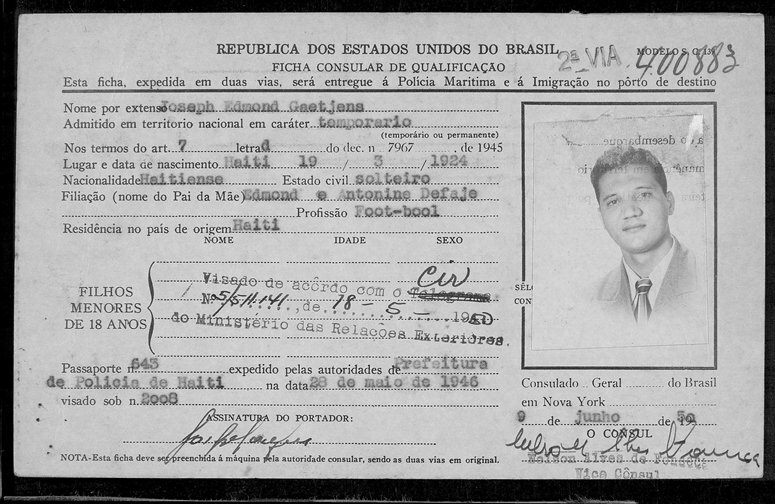 In 1947, with the encouragement of his parents Edmond and Antonine, the fledgling 23-year-old decided to study accounting at Columbia University, New York City on a scholarship provided by his country’s government. The aim was to graduate and gain a respectable job with a good salary. But it was an inevitability that Gaetjens would somehow, someway continue to play football in the USA. In order to earn some extra money whilst studying, he managed to get a job washing dishes at a local restaurant called Harlem cafe. It just so happened that the restaurant’s owner, Eugene Diaz, had recently bought Brookhattan Football Club of the now-defunct American Soccer League (ASL) and Gaetjens was invited to join. 14 goals in his debut season was not a bad return as Brookhattan finished runners-up in the 1948 National Challenge Cup; Gaetjens getting on the score-sheet in a narrow 3-2 loss to Simpkins Ford from Missouri. He saved his best form for his final season, though, notching 18 goals to finish the ASL’s top scorer in 1950. He was a brilliantly effective forward, assured in front of goal and a great all-round player to have in the team. Gaetjens had hit top form at the right time. The USA Soccer Federation were putting together a squad for the upcoming World Cup finals to be held in Brazil and he was called up. Hang on, though, how does somebody born in Haiti go about representing the USA? As James Ferguson points out in his book An Illustrated History of Caribbean Football, a would-be USA citizen only had to state “intent” to be considered American in the 1950s. In other words, as long as you said you would gain citizenship that was sufficient and accepted. On a side-note, at this point Gaetjens had represented Haiti as a 20-year-old twice before in friendlies against Curacao and Venezuela. The Americans were drawn into Group 2 alongside Spain, England and Chile. Very few people knew about the USA team and the kind of approach that they’d take during the tournament. They certainly weren’t expected to pull up any trees. Having fell 3-1 in their opener against Spain, the USA’s next opponent was England – a largely professional team boasting the likes of Sir Tom Finney, Sir Alf Ramsey and Stanley Mortensen. This game in Belo Horizonte was surely going to be a landslide in England’s favour. But Gaetjens had other ideas, scoring a 39th minute header which would go down as one of the most important and memorable goals in World Cup and USA football history. Walter Bahr surged forward and unleashed a seemingly innocuous 25-yard shot which looked as if it could be dealt with by England’s goalkeeper Bert Williams. Gaetjens’s head made contact with the ball before it reached Williams, however, and its sharp change in trajectory completely wrong-footed the keeper. The teacher’s pass was executed by the accounting student and, remarkably, the USA were 1-0 up. England struck the woodwork on several occasions and Gaetjens’ side had to dig in deep towards the end but they did enough to get over the line and secure one of the biggest upsets in football history. The part-timers had beaten the professionals and tournament favourites, without even conceding a goal. 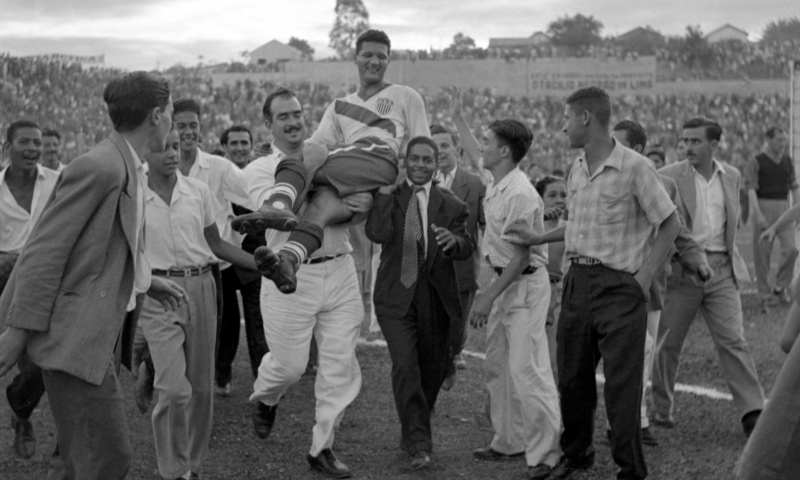 The goal-scoring hero Gaetjens was mobbed at full-time, carried off the pitch by the fans, some of which were Brazilians who were totally enamoured with this new striking superstar. The boy from Port-au-Prince had gone from scoring trademark diving headers for Etoile in his native Haiti to past England in a famous World Cup victory. This is what football is all about. However, Gaetjens’s settled family life was to be tragically torn apart within the next few years. Unfortunately for Gaetjens, who really had no interest in politics, his family were known to Papa Doc for the wrong reasons. His family worked for Louis Dejoie, who was running for president against Papa Doc, and his two younger brothers were involved in a coup d’état being planned in the neighbouring Dominican Republic (located on the right half of Hispaniola). His family fled the country but Gaetjens opted against such a move, blissfully unaware of what was to follow. In July 1964, nearly a decade and a half after that historic winning World Cup goal, something truly terrible happened to Gaetjens. Aware of his name and the fact his family tried to oppose his power, Papa Doc sent “Tonton Macoute” to Gaetjens’ dry-cleaning business in Port-au-Prince where they put a gun to his head, shoved him in the back of his car and drove off to Fort Dimanche prison. 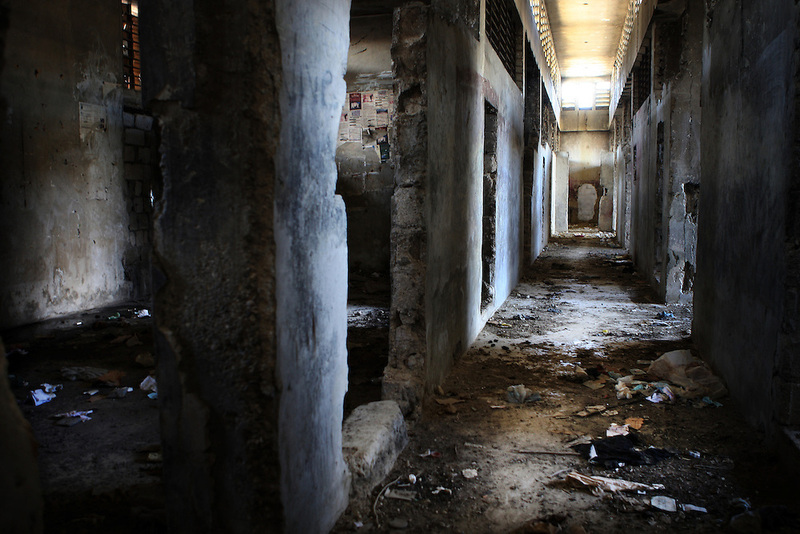 This was an abhorrent place, referred to by some as ‘Haiti’s Auschwitz’, where political opponents would be sent by Papa Doc for interrogation, torture and murder. It is believed that Gaetjens died inside Fort Dimanche during July ’64. His son, Lesly, believes Papa Doc murdered his father, claiming he has a CIA document confirming that the pair were at the prison on the same night. His body has never been found. Gaetjens’ name and legacy lives on. In 1972, he was honoured by the New York Cosmos and a local Haitian side in a benefit match at Yankee Stadium. Four years later he was posthumously inducted into the United States National Soccer Hall of Fame. A film called The Game of Their Lives was made in 2005 about the USA team at the 1950 World Cup, with the Haitian actor Jimmy Jean-Louis starring as Gaetjens. There was even a petition set up by Beyond The Pitch to have the MLS Most Valuable Player Trophy named in honour of Gaetjens, for the contributions he made to American football. Joe Gaetjens was an historic footballer and a genuine family man. He will never be forgotten.